It is difficult to believe that nine years have passed since the September 11th tragedy. It seems like just yesterday we heard those first mind-boggling reports that the first plane, then a second plane, had crashed into the buildings of the World Trade Center. The Pentagon was the target of yet another plane and the one headed for the Capitol crashed in a field in Pennsylvania. The anniversary of the terrorist attacks of September 11, 2001, offers a time to remember, to reflect about this unforgettable moment in history, and to reconsider the effect that September 11th has had on our country and the world. On September 10, 2010, Alto Bonito Elementary had their annual 911 Remembrance. This day was dedicated to the highest act of love one human can show to another. They flew our countries Flag at half mast in honor of the families, friends and loved ones who continue to endure the pain, and for those who today are fighting at home and abroad to preserve our cherished freedoms. We must never forget! 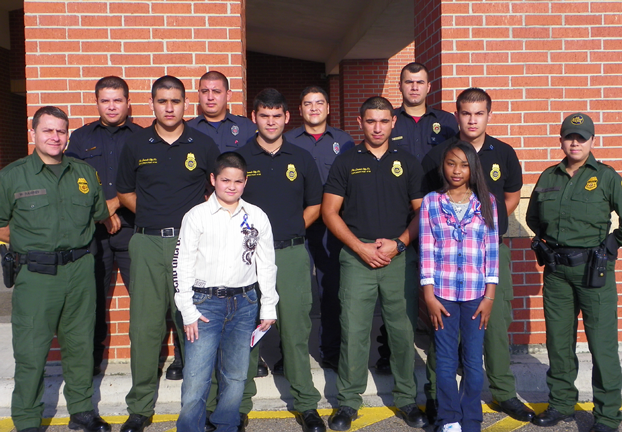 Pictured above are members of the U.S. Border Patrol, La Casita Fire Department and 5th Grade Students of A.B.E. They took part in a Flag Raising Ceremony and were treated to breakfast, all in their honor for protecting our freedom.